Stellar coffee makers are engineered from premium grade stainless steel and are fitted with filters that last a lifetime. 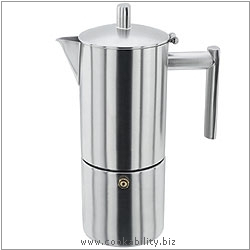 This matt finish stainless steel body hop-top espresso maker makes a quick, perfect espresso every time. Easy to use, easy to clean. Stainless steel lifetime guarantee. Please note that espresso cups are the smallest coffee cups and hold one shot of approx 60ml of espresso. Radiant ring, solid plate, ceramic, halogen, gas.